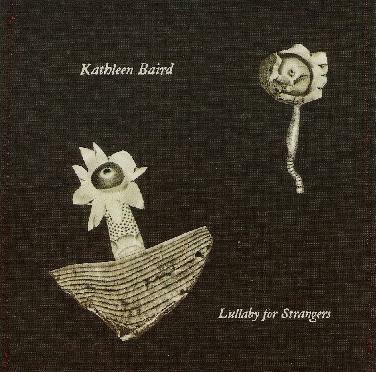 Kathleen Baird - "Lullaby for Strangers"
On the fringes of neo-folk, Kathleen Baird's Lullaby for Strangers is about as "outside" as a traditional form of music can get. Clearly influenced by such iconoclastic avant-folk as Throwing Muses, but with a darker, more apocalyptic feel, many of the songs on Lullaby for Strangers evoke a mood of high gothic grandeur and an atmosphere of almost claustrophobic doom. Baird's spare, austere arrangements compliment her oblique lyrics (Poe and Baudelaire infused with the spirit of Edna St. Vincent Millay), but it's her Teutonic-tinged voice (a direct descendant of Nico's, for sure, but with more than a hint of Amon Duul II's Renate Knaup-Krotenschwanz as well) that really characterizes most of the songs on Lullaby for Strangers. Stark and haunting, Baird at times sounds like a contralto banshee lamenting over the inexorable fate of spirit and flesh in the fallen world. The overall effect is somewhere between Nico's Marble Index, The Cure's Faith and Dead Can Dance's Spleen and Ideal. Textually, one might describe Baird's music as Goth-folk, particularly pieces like "Morning Song #1 (which could easily be an excerpt from the soundtrack to any number of German Expressionist films such as Das Kabinett des Doktor Caligari or Faust) and "With Which These Waters Swarm," both eerie evocations of Baird's cryptic, dream-like vision that reminds one of both Kate Bush and Kafka at their most obscure. Baird uses an array of hand percussion, along with piano, organ, synthesizer and guitar in a way oddly reminiscent of such chamber rockers as Art Zoyd and Birdsongs of the Mesozoic but in a far more human, more personal quest for emotional redemption and self-understanding in the chaos of the post-modern world. But it's Baird's marvelously hypnotic voice that you'll surrender to long after sunset in the pervading gloom of a dark and dreary December evening. And with lyrics that blur the distinction between music and poetry, you'll swear you're hearing a 21st century incarnation of Emily Bronte singing forlorn vignettes of doomed lovers trapped in the meshes of some inscrutable destiny ("Bury Deeper," "Storms Stay Fine"). Connoisseurs of the strange and angels of the odd will find much to treasure in Baird's collection of curios from the dark chambers of her heart and soul.